From time to time, I receive letters from Roman Catholics who claim that I should retract my writings on the subject of the Roman Catholic Church because, they allege, I don’t understand Roman Catholicism. These people usually tell me that to understand Roman Catholicism properly I must read some Catholic apologist such as Karl Keating or Keith Fournier or Peter Kreeft or Scott Hahn or Patrick Madrid. I have been answering this charge for decades, since Jesuit priests first made it to me in South Asia in the early 1980s. The following is my reply to this accusation. 1. I BASE MY VIEWS OF THE ROMAN CATHOLIC CHURCH DIRECTLY UPON ITS AUTHORITATIVE DECLARATIONS, SUCH AS THE COUNCIL OF TRENT, PAPAL BULLS, THE VATICAN II COUNCIL, AND THE NEW CATHOLIC CATECHISM. These contain the voice of authoritative Roman Catholicism. Karl Keating, Keith Fournier, Peter Kreeft, and Scott Hahn are Roman Catholics, and they have their own opinions and interpretations about Roman Catholicism, but they are not authoritative voices for the Roman Catholic Church. When I have wanted to know what genuine Roman Catholicism is, I have gone directly to the top. I built a large library of Roman Catholic books, and I have studied them. I have visited Catholic churches and attended mass in at least fifteen countries on three continents and have talked with Catholics in many parts of the world. I have been to Rome three times. I have visited some of the largest Catholic shrines in other parts of the world. In reality, almost any doctrine can be found in the midst of the Roman Catholic Church. There have always been a multitude of opinions encompassed within Romanism, but there also has been an authoritative declaration of what the Roman Catholic Church officially believes. "If anyone shall say that the ungodly man is justified by faith only so as to understand that nothing else is required that may cooperate to obtain the grace of justification, and that it is in no wise necessary for him to be prepared and disposed by the motion of his own will . . . let him be accursed" (Canon 9).And "If anyone shall say that justifying faith is nothing else than confidence in the divine mercy pardoning sins for Christ’s sake, or that it is that confidence alone by which we are justified . . . let him be accursed" (Canon 12). "Sacred Tradition and sacred Scripture, then, are bound closely together, and communicate one with the other. For both of them, flowing out from the same divine well-spring, come together in some fashion to form one thing, and move towards the same goal . . . Thus it comes about that the Church does not draw her certainty about all revealed truths from the holy Scriptures alone. Hence, both Scripture and Tradition must be accepted and honoured with equal feelings of devotion and reverence" (Vatican Council II--The Conciliar and Post Conciliar Documents, p. 682). "The doctrine of purgatory clearly demonstrates that even when the guilt of sin has been taken away, punishment for it or the consequences of it may remain to be expiated or cleansed. They often are. In fact, in purgatory the souls of those who died in the charity of God and truly repentant, but who had not made satisfaction with adequate penance for their sins and omissions are cleansed after death with punishments designed to purge away their debt" (Vatican Council II--The Conciliar and Post Conciliar Documents, p. 75). "‘Finally the Immaculate Virgin, preserved free from all stain of original sin, when the course of her earthly life was finished, was taken up body and soul into heavenly glory, and exalted by the Lord as Queen over all things, so that she might be the more fully conformed to her Son ...’ The Assumption of the Blessed Virgin is a singular participation in her Son’s Resurrection ... ‘In giving birth you kept your virginity... You conceived the living God and, by your prayers, will deliver our souls from death’ (Byzantine Liturgy, Troparion, Feast of the Dormition, August 15th. )” (New Catholic Catechism, 966). "For I testify unto every man that heareth the words of the prophecy of this book, If any man shall add unto these things, God shall add unto him the plagues that are written in this book: And if any man shall take away from the words of the book of this prophecy, God shall take away his part out of the book of life, and out of the holy city, and from the things which are written in this book" (Revelation 22:18,19). It was not the Catholic Church that gave us the Bible; it was the Apostles through the promised Holy Spirit. They delivered to us the doctrines that God wants the churches to follow until the return of Christ. They delivered the "faith once delivered unto the saints" (Jude 3). Whatever is contrary to the completed Scripture is error. It is Scripture that is given by divine inspiration, and the Scripture is able to make the man of God perfect. The Catholic Church’s traditions aren’t Holy Scripture. Therefore, we don’t need the Catholic Church’s traditions. Since the Scripture is able to make the man of God “perfect,” it is obvious that the Scripture is sufficient. Paul taught us that the Scripture is the sole authority for faith and practice. The Roman Catholic Church claims that it gave us the Bible, but it is a strange thing that the Roman Catholic Church is not in the Bible! In the Bible, Peter was not a pope. He was a married man with no throne and no crown and no palace and no treasury. Mary is the mother of Jesus, but she is not called the mother of God or the queen of heaven or the co-redemptrix, and no one prayed to her. The Lord’s Supper is symbolic of Christ’s body and blood and is done in remembrance of Christ’s death. This doctrine was taught to Paul by divine inspiration (1 Corinthians 11:23-26). There is no special priesthood in the New Testament churches. Rather, all believers are priests (1 Peter 2:9). In the New Testament there is no rosary, no veneration of relics, no pilgrimages to holy shrines, no incense, no candles, no robes, no purgatory. When studying Roman Catholicism, I have gone to the top, to the most authoritative voices. I have read Catholic apologists, but I don’t need to have Rome’s doctrines filtered for me by them. Letting a Catholic apologist "explain" Catholicism is a kin to letting a political "spin doctor" explain a presidential speech. I will hear it and understand it for myself, thank you. 2. I HAVE AN UNCTION FROM GOD AND I CAN THEREFORE JUDGE AND INTERPRET DOCTRINE. "But the anointing which ye have received of him abideth in you, and ye need not that any man teach you: but as the same anointing teacheth you of all things, and is truth, and is no lie, and even as it hath taught you, ye shall abide in him"(1 John 2:27). This verse instructs me that the Holy Spirit is my teacher. He will enable the child of God to understand and interpret doctrine, to discern truth from error. If someone tells me that I cannot understand doctrine for myself, he is calling God a liar. 3. IF A CATHOLIC CAN UNDERSTAND BAPTIST DOCTRINE AND REJECT IT, I CAN UNDERSTAND CATHOLIC DOCTRINE AND REJECT IT. Those who claim that I cannot properly reject Roman Catholicism because (they allege) I don’t understand it (in spite of the fact that I have studied its official writings) are the same ones who have rejected Baptist doctrine and speak against it. Apparently, they are capable of understanding and rejecting Baptist doctrine, but I am not to be given that same privilege in regard to Catholic doctrine. My sole authority in faith and practice is the Bible. That is the measuring rule that God has given me. The Scripture is able to make "the man of God perfect, throughly furnished unto all good works" (2 Timothy 3:16-17). I will therefore use the Scripture to test every doctrine, and I will reject doctrine that is contrary to the Bible. Having examined Roman Catholicism by this ABSOLUTE STANDARD, I have rejected it as gross error. As a God-called preacher, therefore, I must warn people of this false system. This is not hatred. This is not anger and bitterness. This is not jealousy. This is not ignorance. This is not sectarianism. This is obedience to the Word of Almighty God. “We cannot allow that every private Priest or member of the Church of Rome should give his own opinions merely as the standard of doctrine. We will have recourse to the oracular response of the Church, and insist that they be represented by themselves; not, however, by private individuals, but by their legal representatives. But, then, there is nothing which they dread so much as the testimony of their own Church. ... IT IS A PRINCIPAL AIM OF ALL [ROMAN CATHOLIC] CONTROVERTISTS TO EMPLOY EVERY MODE OF EVASION IN ORDER TO DISCONCERT THEIR OPPOSERS. There is even a marked difference between the tone of these Romish Divines who speak dogmatically for the instruction of their own members and that of those who attempt to answer the objections of their antagonists. With the former, all is matter of downright certainty; with the latter, all is doubt, difficulty, subterfuge, and evasion. When the faithful are to be instructed, every Priest becomes the sure depositary of the infallible decisions of an infallible Church; but when Protestants are to be confuted, the declarations of their most illustrious men are of no authority. Councils are discovered to have been but partly approved; Popes did not speak ex cathedra; Cardinals and Bishops are but private Doctors; and who cares for the opinion of an obscure Priest or Friar? 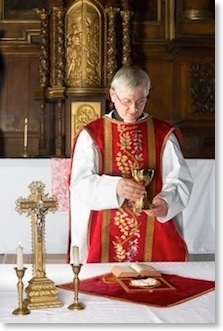 Thus nothing is so difficult as to know what the belief of Roman Catholics really is; and WHEN A PROTESTANT ADDUCES THEIR OWN WRITERS AS WITNESSES, HE IS FREQUENTLY TOLD THAT HE IS A MISREPRESENTER OF THEIR CHURCH” (Charles Elliott, Delineation of Roman Catholicism, London: John Mason, 1851, p. 23).